1846. 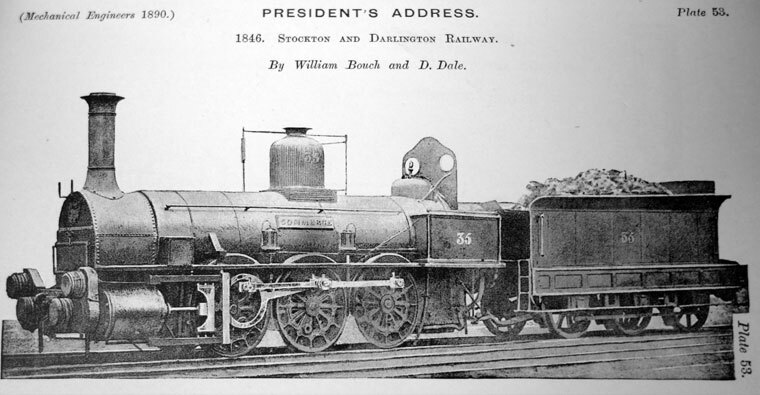 The 'Commerce' engine by William Bouch and David Dale for the Stockton and Darlington Railway. Apprenticed to Robert Stephenson and Co on Tyneside. Railway engineer on the Stockton and Darlington Railway. 1858 of Shildon Engine Works. WILLIAM BOUCH was born in 1813, and after serving his time in the works of Messrs. Stephenson, Newcastle, went to Russia and became chief engineer on a vessel in the Russian navy, which position he occupied for several years. Returning to England in 1840, he was appointed Locomotive Superintendent of the Stockton and Darlington Railway, where he brought out several improvements connected with the locomotive engine. He held that position till the time of his death, which occurred at Weymouth on 19th January 1876 at the age of 62, after several months of failing health. He was also conjoint engineer with Mr. Hawksley of the Weardale and Shildon District Water Works and of the Consett Water Works; and in addition was a prominent member of various ironworks and engineering firms in the North of England. He became a Member of the Institution in 1858. This page was last edited on 25 April 2017, at 19:35.